What is the link between Little Red Riding Hood, proteins, and carbohydrates? Let me give you some clues! Red Riding Hood and her grandmother are characters I like, while I’m afraid of the wolf. Now, what if I say I’m afraid of carbohydrates just like I’m afraid of the wolf - can you see where I’m going with this? Let’s think back to the story. Red Riding Hood is on her way through the woods to see her grandmother. That’s like being on a journey of weight loss and then maintenance after bariatric surgery. But, Red Riding Hood strayed from the path while picking some nice-looking flowers, and she ended up getting lost. She ran into the wolf who seemed quite harmless at that stage. I’m thinking that’s like being led astray by temptation without even noticing – in other words, old habits being slowly reborn. This can cause a whole lot of distress and worry with weight regain. Do you remember Red Riding Hood was helped by the hunter when she was lost? She got back on the beaten path, and she arrived safely at her grandmother’s. Red Riding Hood sensed danger. Her grandmother seemed a little different. She looked the same, but she did have bigger eyes ‘to see’ Red Riding Hood, and she did have longer ears ‘to hear’ her too. The danger of course was the wolf disguised as Red Riding Hood’s grandmother. This is where I see the wolf being like some products out there pretending to be good, but actually they may be the slippery slope to eating more carbohydrates than protein, with time. These ‘wolves’ are in the Hot Seat this month. Drew’s Hot Seat –the hunter or the wolf? I’m seeing slippery slopes every time I go shopping. I see reduced-fat protein ice cream, next thing I’m seeing recipes for chocolate fudge protein balls and the like, and then I’m facing convincing marketing for low carb ‘snacks’ like an Atkins bar in the health foods aisle. I look at all of these foods and I think, yes, they may be sources of protein, but are they the wolf pretending to be the grandmother… if you get my meaning? Research has shown the proven path to weight loss maintenance. It involves three regular portion-controlled meals each day, and they are nutrient-dense rather than energy-dense. In other words, breakfast, lunch and dinner consist of mostly protein to manage the feelings of fullness between meals. The research also shows that weight regain happens when dietary behaviour is led astray from this path by energy-dense foods and snacking (Elfhag & Rössner, 2005). Now let’s imagine we are at a cross-road. One road is for weight loss maintenance, while the other is for regain. If I took the mask off high protein ice cream and called it ice cream, which road would you say it belongs down? What about the chocolate fudge protein balls if I said they are energy-dense? Finally, which road does the low-carb snacks belong down if I simply said they are snacks? I know the mind can be convincing and justify these foods as okay, but these wolves risk sending you down the wrong road! So, lets look at some ways for going down the road for maintenance. Protein is our hero of this story. Just like the hunter helped Red Riding Hood find her way out of the woods, protein at your three main meals can help you and your appetite. I see cooking methods as a great way of boosting your intake without adding volume, so I’ve been busy in the kitchen to show you my thinking. Milk is a great liquid for poaching top level proteins. My recipe below is a really good way for making chicken breast or tenderloins moist enough to chew thoroughly. A thickener like cornflour means a sauce can be made for boosting the protein of your meal which can be saved and enjoyed for lunch the next day. For example, I made a walnut and rosemary crumb. I’m sorry to say I’m neither a chef nor food photographer, and I wish I’d put a nice garnish on before the photo. Anyway, I’m hoping you can see this quick and easy meal as a way of cooking your protein and getting more protein-bang for your buck by poaching in milk. Especially when fortifying your milk. Many of you already know I add skim milk powder to the milk I’m using each day. Ideally, adding a flavourless protein powder is better, but the table below shows how two tablespoons of milk powder alone can increase the protein and calcium content of one cup of milk. I actually add eight tablespoons to one litre of milk, and then I use that fortified milk for cooking my oats in at breakfast, or for adding into cups of tea or coffee over the day. I also use it for poaching other proteins like nice fillets of fish or making curried eggs after work on a Friday. Basically, you can add a whole range of herbs and spices and thicken the milk for a tasty sauce of your preference. Just like a fairy tale, there’s a moral to this blog. A weight loss journey is a long hard road which you know better than most. I hope I’ve helped you stop for a moment and think about the wolf you may see when making food choices each day. 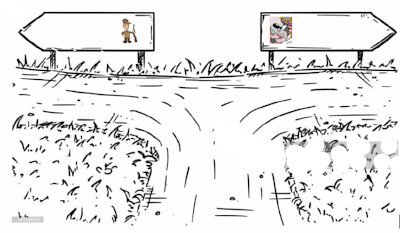 Remember to ask yourself at the crossroads – am I looking at the wolf or the hunter? All the best and looking forward to next month’s blog. 1. Elfhag, K., & Rössner, S. (2005). Who succeeds in maintaining weight loss? A conceptual review of factors associated with weight loss maintenance and weight regain. Obesity Reviews, 6(1), 67–85.